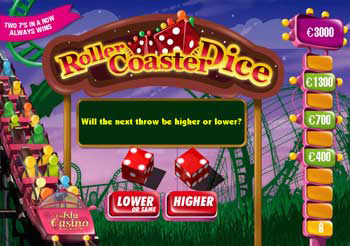 Your objective is to predict whether the next roll of dice will have a higher or lower total than the last. First, choose the amount you want to wager and click Play. Two dice are rolled. Now you have to predict the next result. If the total is less than 7, you have to choose between the options Lower or Equal and Higher. If the total is 7, you have to choose between Lower or Equal and Higher or Equal. If the total is greater than 7, you have to choose between Lower and Higher or Equal. Note that two 7's in a row takes you to the next level, no matter what you choose. If you choose incorrectly, the game ends and you lose. If you choose correctly, you advance to the next level. If you reach a cashout level, your bet is multiplied by a certain number and you can cash out. However, you can choose to keep playing in order to go for an even higher cashout level.